The days of heading to the only town blacksmith for ironworking projects are long gone. However, you should still rely on local expertise and traditional techniques for the highest quality iron works. For the past two generations, our company, Anderson Ironworks, has developed a renowned reputation for the iron works Main Line PA looks to. When it comes to metal work, we do what other companies cannot. Learn more about the customer-focused process that makes our work so sought after. Our first step is to meet with you virtually or in person, whichever you prefer, to determine your vision. Whether you’ve got a clear, concrete depiction to share or more of a general idea, this initial consultation will get us all on the same page. We will show you samples and discuss your desired budget and timeline. Using the information we gather from this initial consultation, we will provide a quote for your project. From here, we head back to our shop and work out a 2 dimensional rendering using specialized design software. Our programs allow us to create a concrete image to show customers what their final project will look like. Once your payment plan is settled and you approve the design, we begin the next phase. Now, it’s time to create your custom piece. Our skilled craftsmen use the 2D design as a template. Through an expert knowledge and respect of the materials, we are able to make something beautiful, durable, and unique. After this, the last step is for us to install and you to enjoy! 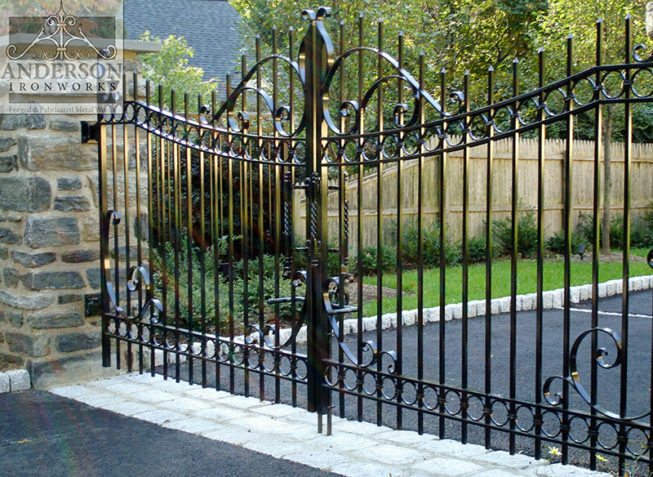 Whether you like the idea of creating a unique ironwork project for your home, or if you’d prefer to peruse our catalog of predesigned options, our company is here and ready to serve you. When considering any kind of permanent fixture for your home, it’s important to seek out professionals. For iron works Main Line PA homes and business need, call the award-winning Anderson Ironworks. We look forward to walking you through the process to ensure your complete satisfaction.